← Coconut infused quinoa, topped with a ginger vegetable medley saute and seared wild sea scallops. When I was little I was notorious for going, going, going. I never wanted to miss a moment, miss a party, miss a chance to be the center of attention. I would rush from activity to activity, ignoring my mother’s admonitions to slow down. When I could go no further I would crash, falling fast asleep wherever I was, and like a light bulb, I was out. I’m afraid that the years have made me only slightly better at understanding the importance and value of taking a moment to be quiet. I still find myself rushing, feeling a constant sense of urgency, whose source I can’t always identify. My mother will be able to hear it in my voice on the phone and quietly say, “Erina, Erina, Erina….you have got to take a breath.” After 10 days of house guests, one half-marathon, an unbelievably intense work environment, and one book club, this Saturday morning I was finally ready to do nothing. Nothing except cook, listen to music, read, and hang out with the dogs that is. (come on…like I said…I’m only slightly better). 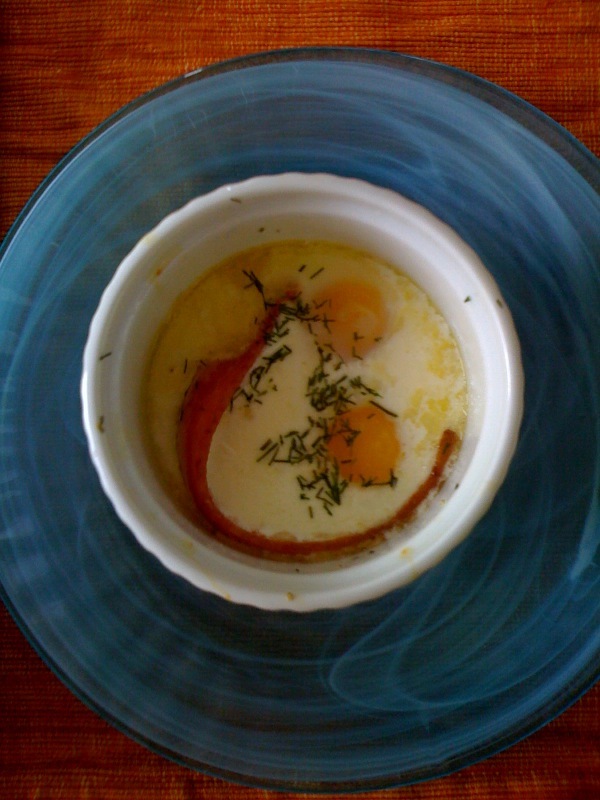 These baked eggs are the perfect accompaniment to such a morning. They’re easy to prepare, but take a bit of time to cook, forcing one to make a cup of tea and just be for a moment. The recipe pictured here was me trying to do a ring of bacon in the ramekin, which I don’t think is really the best solution, which is why I’ve suggested chopping up the bacon next time. 2. Divide the butter between two shallow ramekins and grease. Put a pinch of salt and pepper in the bottom of each ramekin. 3. 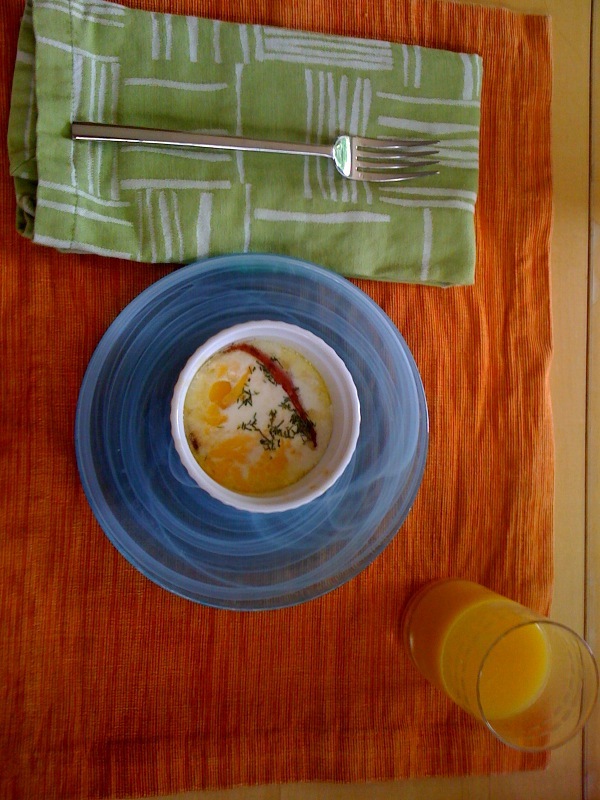 Crack two eggs into each ramekin, being careful not to break the yolk. Add the coarsely chopped bacon and cheese if you like. 4. Pour over top, 1 TB of heavy cream for each ramekin. Sprinkle with fresh dill. 5. Set the ramekins in a bread pan filled with water, and bake for about 18-20 minutes or until yolks and whites are just set. (Pending how you like your eggs, cook longer or shorter for runnier or firmer).